When I reviewed the JBL Xtreme speaker, I didn’t consider it as a portable speaker. Of course, it’s a Bluetooth speaker that doesn’t have to be connected to a power source all the time, but at the same time, its big size and weight make it more suitable to pack into a car trunk than a backpack. But this speaker is probably not big enough for JBL, so they decided to take create an even bigger model called JBL Boombox. Let’s see how it compares to JBL Xtreme. Xtreme weights almost 5 pounds (2,1 kg), but this size is manageable, especially if you use a carrying strap, included in the box. On the bottom of the speaker, there are rubber feet that keep JBL Xtreme stable when playing music. You could also place the speaker upright, but it will block one of two passive radiators, resulting in sound distortion. power jack where you can plug in the power brick. The Boombox has the same cylindrical shape as other JBL speakers (Flip, Charge, Xtreme, Pulse), but what distinguishes it from all other devices is its size. 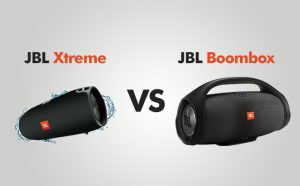 While Xtreme is large, Boombox is a behemoth among other Bluetooth speakers. It’s twice as big as Xtreme and weight almost 12 pounds. It’s equipped with a handle that will help you to transport and use it in a similar way as Boombox radios from the 80s. control for switching between Indoor and Outdoor sound modes. On the front of the devices, there are five LEDs that will let you know how much battery life is left. Hold it down for a few seconds to pair your speaker with your phone or tablet. Press once to pause, press twice to skip a song, press three times to go to the previous song. The JBL Xtreme speaker is wrapped in a special material that makes it splash-proof, so a bit of rain won’t hurt, just don’t take it anywhere near a swimming pool. Boombox, on the other hand, received the IPX7 rating. This means that it can be submerged up to 1 meter for about 30 minutes. This speaker actually floats, making it a great candidate for a pool speaker – just be sure that the rear flap seals tightly. Xtreme is equipped with two 35 mm tweeters and 63 mm woofers, and Boombox with 20 mm twitters and two 100 mm woofers. Xtreme is more than enough if you’re throwing a party, whether indoor or outdoor. It can handle different genres of music – jazz, rock, EMD, or classical. Its woofers are quite large enough to deliver a solid bass with ease. The passive radiators which are located on both sides of the speaker make bass even punchier. The mids are also clear and warm. The biggest complain I have is about treble. If you turn up your volume high enough the highs will become a bit harsh. But Xtreme is loud enough so probably you don’t even need to go that far. If you lower your volume a bit they will become detailed and focused. This speaker is even better for parties (especially big ones) or gatherings than Xtreme. While Xtreme is great at the low end, Boombox, thanks to its big woofers and passive radiators on each side, delivers even greater bass. If you listen to this speaker indoor, even 50% of the volume is enough to fill with sound an average room. When you use a Bluetooth speaker outdoor, where there are no walls for sound to bounce off, the bass is often lost, but switch Boombox to the outdoor mode and you will get a bass boost that will compensate for this inconvenience. Boombox delivers a great sound at all: low, mid and high frequencies. If you go very loud, you will probably hear some distortion, assuming that you will ever need that level of volume. Connectivity in JBL Xtreme is decent but not great. The connection was solid and I didn’t experience any stuttering when there were no obstacles between the devices. If you have a wall of two you may experience signal drops, but even then these instances didn’t occur very often. 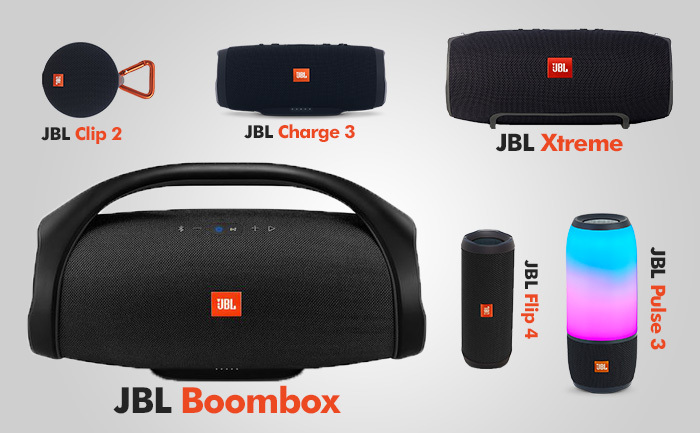 JBL Xtreme offers the JBL Connect feature that will allow you to connect multiple JBL speakers and play them in sync. Just be sure that they offer the JBL Connect feature. Connectivity in Boombox is excellent. You can be as far as 20-30 feet away from the speaker, even if there are some obstacles on the way. After you connect it for the first time, the speaker recognizes your phone in a few seconds. Boombox offers the updated JBL Connect feature called the JBL Connect+. Before you try to connect Boombox to another speaker, make sure that it is updated to the latest version. Once you do it, you can choose whether you want to play the two speakers in the stereo mode or party mode. You can connect up to 100 speakers at the same time. Unfortunately, it doesn’t offer an equalizer, which would be great to tweak some treble or bass. JBL packed a 10,000 mAh battery into Xtreme. It should last about 15 hours at the medium volume level. The Boombox battery is twice as big and offers 20,000 mAh. The downside is that you need a real AC adapter. You won’t charge it via USB. The full charge of an empty battery will take 6.5 hours and it will last 24 hours. Both speakers offer a series of small LED light on the front of the speaker. They indicate how much battery power is left. You can use Xtreme and Boombox as a power bank and charge your phone while playing music. PROS: Powerful audio / Good bass / Built-in mic / Splash-proof / Power bank. PROS: Booming bass / Indoor and outdoor mode / Waterproof. CONS: A little bit of harshness at higher volumes / No equalizer in the app. CONS: No equalizer in the app. 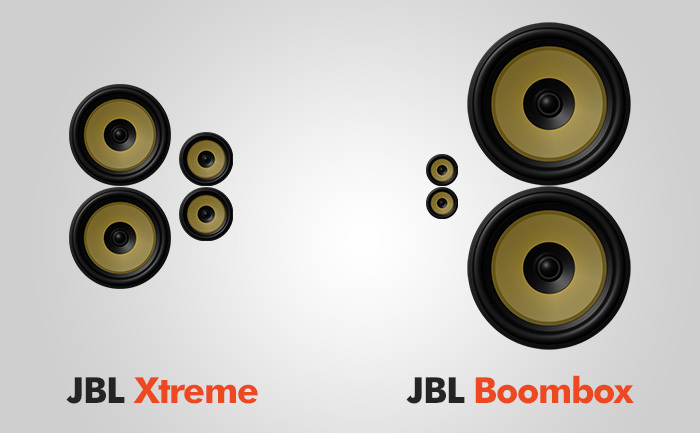 The JBL Xtreme is a great speaker, but Boombox takes all advantages of his older brother and improves it in many ways. It costs twice as much, but also offers much more. If you have that much money and you also want to listen to music outdoors, Boombox is your speaker, otherwise, choose Xtreme.